The hard rain that usually fell on the city next to the rainy city. I pulled my chinos up so the bottoms would not drag in the puddles, and shuffled down the lane to the bus stop. The 100 bus arrived on time, just – it meandered through the streets of the city, via the Precinct area, and onto the main road into the other city. It was diamond jubilee pageant day. Down south they were sailing boats, up here in the north we were playing music. I got off the 100 at the end of Chapel Street, and strolled past the new developments to Bloom Street and the Kings Arms. It was unseasonably cold for June. Annoyingly I had missed two of the bands I wanted to see – Zap Zap Zap, and Saturday Morning Cartoons (members of which were eating chips in the vestibule as I approached the pub). A pint of Unicorn and a chance to see the last couple of tracks by Ben Peel and the Bradford City Wool Band who got better as the set progressed. Then the guitar and drum duo of Ruby Tuesday who like The Calimocho Club and Kill for Company manage to deliver a big sound with just two players. Intense modern blues rock which demands further hearing. Another pint and then a listen to Dear Sherlock who came over all Muse/Octopus and didn’t appeal so I nipped off for a bag of crisps and a natter with Mr Jon Coupe who arrived in his usual dapper attire. Neale James changes the line up of The Happy Fallen every time I see them – this time he has Mike Murray (of Easterhouse fame) alongside him and they work their way through some fine psych garage rock. Would really like to see Neale with a full band behind him as I reckon it could be a hell of a thing to witness. Downstairs for a rum and coke – and had a chat with Tamsin about the progress of the Mr Heart album – which is nearly ready. Another line-up change this time for the next band Stalagmites who are down to a trio with Brad and Alex sharing bass and guitar duties (“it’s easier for us to write the tunes with this line-up” says Brad) – hadn’t seen the band for a while (about a year) so there has been significant change and I confess I did not recognise a lot of the material. Most enjoyable though and I look forward to more from them – Brad is one our better singers and deserves a wider audience and the group certainly create a huge sound. They will be doing some recording at 6dB in the near future. Downstairs for another rum and coke and a short chat with Doug and Neil from The Ascension and a meet up with Monty, who has arrived fashionably late, and then back upstairs to watch headliners AAAK. This time around it’s a five piece with Howard Jones on drum pads, Neil Rowbotham on guitar, and Tamsin on vocals and hitting things with sticks, joining Ding and Paul. 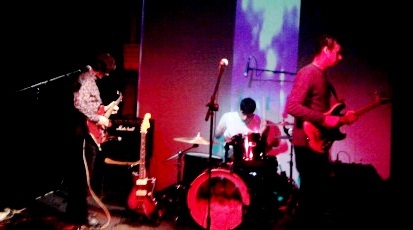 They are launching the new album Totalitarian Tip Toe and are in breathtakingly good form. It translates well to the live setting and the additional band members bring an added dynamic to the sound. This music is brave, bold and modern – totally in your face and top tappingly good. Ding remarks that some of us are dad-dancing and wants us to move a bit more – doesn’t he know we are getting on a bit? Selected tracks from the new album, a new tune (whose name I didn’t catch but which was rather fine indeed) and then the return of the excellent “Sharpshooter” to the set list made for an entertaining 30 minutes – I could have done with a lot more frankly as the grooves were exquisite although I did get an Alannah Currie flashback with Tamsin’s moves when she was menacing the drum pad with a stick. If you haven’t caught AAAK live then I suggest you should as they an excellent outfit and deserve a large audience. Afterwards a quick lager and another rum and coke with Monty and Chris from Factory Star and then home (thanks to Chris for the lift and the sneaky preview of some excellent music) – it had stopped raining by then. Kudos to Paul Travis for putting on an excellent day of entertainment – sadly there were not a huge number of people there and if you weren’t and you are local then you missed a belter. Posted on June 5, 2012 June 5, 2012 by HalfEdgeMediaPosted in Gig ReviewTagged AAAK, Ruby Tuesday, Stalagmites, The Happy Fallen.